I need videos of our shelter pets. If you volunteer at the shelter, or have adopted an animal from us, and have taken a video of the adoptable or adopted animals, please share it with us. Send your videos as an attachment in an email to dave@nokillarc.org, along with a description, and I will post them with credit given to you (unless you tell me otherwise). Raw video from your digital camera is is best, but cell phone video is good, too. MILLVILLE — Unwanted and malnourished dogs have become increasingly frequent finds for the animal shelter here in the wake of last month's flood. One pooch was rescued after someone spotted him tied to a front porch at a Scott Township home in the flood zone, says Linda Bird of the Animal Resource Center. It didn't look like the owner was expecting to return anytime soon. 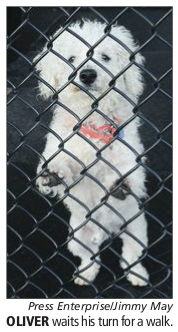 Another was found at Bloomsburg's Town Park, running loose without a collar. Bird suspects that dog's owner removed her tags and dumped her there after the flood. Many of the recent finds — eight stray pooches were picked up last weekend alone — are emaciated and covered in fleas and ticks as if they've been on their own for weeks. "A lot of them seem to have been running for awhile," Bird said. Feeding the dogs isn't a problem; the no-kill shelter has plenty of donations from local processing plants and stores. But the influx has left the non-profit struggling with mounting vet bills and a building that needs $30,000 more in work to keep the dogs warm through winter, Bird said. For now, 20 dogs at the shelter are squatting in space made to accommodate eight. Once the work is complete, the place could house 25. Adoptions, and the funding that comes with them, are down, Bird says. "The adoptions were going very, very well until the flood hit." Only three dogs have found homes in the last month. Over the same time, "the number of strays has just gotten unbelievable," Bird says. She blames the flood, straining folks who were already burdened by the poor economy. Now it's ARC that is struggling to make ends meet. "We can barely keep our head above water," said Bird. Some animals at the shelter are being held temporarily while residents struggle to renovate their flooded homes or find new places to live. One man was run out of his Ninth Street home in Bloomsburg and had to put his two cats in the shelter. He comes to visit his pets often, Bird says. And there are some tears. "It is devastating when you have to leave your animals," Bird said. Even with the shelter already above capacity, she finds it difficult to turn animals away. "We don't ever want to say 'no.'" Bird says the state doesn't have any grants available to help. 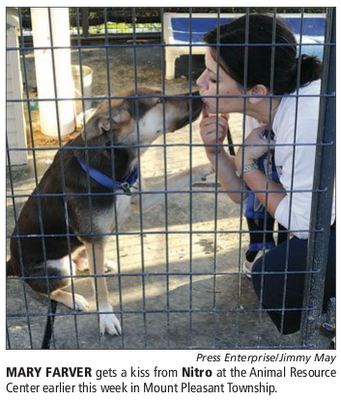 So the shelter has to rely on donors and fund-raisers throughout the year. But a few events were canceled or postponed because of the flood last month. Bird estimates the group has about $4,000 less than it usually does this time of year. In an average month, veterinarian bills ring in at about $5,000, she said. Purina recently gave the center 4,000 pounds of pet food, and Del Monte and Tech Packaging routinely donate food. Walmart, meanwhile, gives broken bags that can't be sold at the store. But ARC still needs monetary donations to cover veterinary care and to buy materials to finish an area of the building to house dogs over the winter. That section will be warmed by a pellet stove that was already installed. The project will take about $100,000 total to complete, but the group plans to work on the structure in phases as funding becomes available. Residents willing to adopt or foster animals would also alleviate some of the crowding, Bird noted. However, she said cats and kittens are comfortable in their area, with more than 50 living as colonies in several large rooms. To donate: www.nokillarc.org, Animal Resource Center on Facebook, or send a check to ARC, 301-A Boone Road, Bloomsburg, PA 17815. Tell your story. Kristin Baver can be reached at 387-1234 ext. 1310 or kristin.b@pressenterprise.net. Or follow her on Twitter @KristinBaver.